Of all the many plays he has written, Out of Order is the one that Ray Cooney favours the most and so it seems quite apt that 26 years after he first directed the production, he has returned to direct it again in one of the slickest farces you will probably ever see. This latest touring production of Out of Order has a stellar cast and this is, no doubt, due to the popularity and skill of Mr Cooney’s directing and playwriting talents. For an actor, the experience of working with Ray Cooney must have a huge appeal and to have the likes of Shaun Williamson (Eastenders, Extras), Sue Holderness (Only Fools and Horses), Susie Amy (Footballers Wives) James Holmes (Miranda) and Arthur Bostrom (Allo Allo) all appearing in the same production is surely testament to this. The play takes place in Suite 648 of the Westminster Hotel - just across the road from the Houses of Parliament. Conservative Junior Minister, Richard Willey, is about to embark on a night of passion with none other than Labour’s Jeremy Corbyn’s secretary, Miss Worthington. Naturally, things don’t run as smoothly as Mr Willey anticipates and their secret liaison is drastically hindered by the discovery of a body trapped in the hotel’s only unreliable sash window. Instead of a night of steamy romance, the evening descends into a riotous mission of trying to avert both parties’ spouses from finding them out with Mr Willey’s trusty aide, George Pigden exasperatingly caught within his boss's comically tangled web of deceit. This production has been brought up to date with Cooney re-writing parts of his play to make it more viable for modern day audiences, giving references to mobile phones (conveniently turned off or left at the office), emails and even Twitter! He has also lent the political relevance of the proceedings a more present day feel, with Theresa May, Jeremy Corbyn, Boris Johnson, UKIP and Brexit all getting a mention. Essentially though, the plot is the same as the original script and the humour and fun that is to be had from it never falters along with the laughter from the audience. Jeffrey Harmer and Shaun Williamson as Richard Willey and George Pigden have relentless pace and carry the show with great chemistry and gusto, giving the audience plenty of laughs. This is especially so when they are in the process of trying to hide ‘the body’ from the Hotel Manager played by Allo Allo’s Arthur Bostrom, in great form, and the irritating hotel waiter, played by James Holmes, eeking out the ‘I’ll get you out of a fix but I’ll need paying’ gag for all its worth. David Warwick plays The Body so brilliantly, you actually forget that he is in fact an actor pretending to be dead, and it’s no surprise to learn that he has been playing this role on and off since 1991 and has even directed other actors to play the part in other productions. Sue Holderness (Pamela Willey) is as delightful to watch on stage as she is on tv and Susie Amy as Miss Worthington is a treat. It’s always exciting to see home-grown talent on the Palace stage and it was great to see Elizabeth Elvin back on the very first boards she ever trod in the role of the feisty Nurse Gladys Foster. 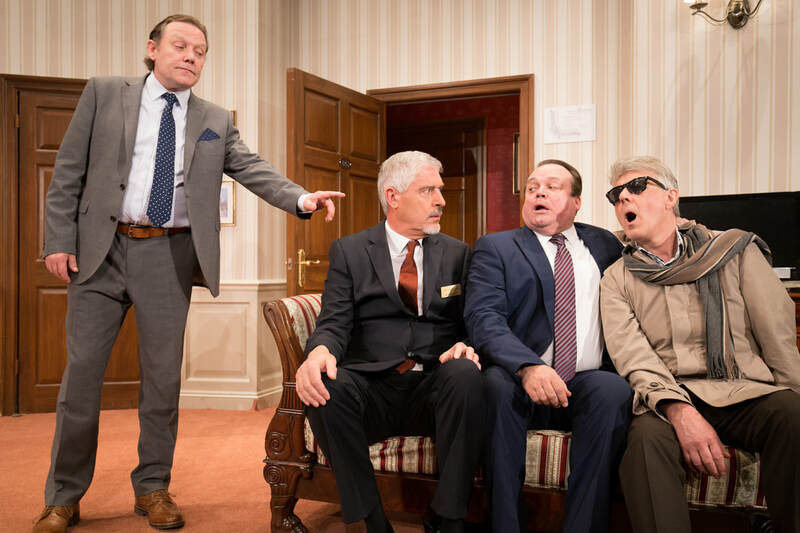 The whole cast give a masterclass in performing farce in this production and it was also great to see the backstage ‘techies’ in charge of the aforementioned sash window, getting a well deserved nod of recognition in the curtain call bows. Despite its update, this play still has an old fashioned feel to it and I wonder if it would have worked just as well by sticking to the original script. That said, however, I’ve no doubt that whichever period it was set in, it would still tickle audience's funny bones, especially judging by the reactions of the first night audience in Southend, all of whom poured out of the auditorium with huge smiles on their faces. For a good old fashioned giggle - get yourselves in order and get along to the Palace Theatre this week.